This is the most abused, mistreated and misrepresented curry in the whole of the world. There isn’t another Asian dish that comes close to this one in terms of how people view it. Its reputation is right down there in the gutter. A vindaloo is nothing more than a macho challenge after sixteen pints of lager and a fight. The British curry house version of a vindaloo does the recipe a great dis-service. Yes, it’s a hot dish, it’s fiery, but it’s really quite an unusual curry, with an interesting provenance. The vindaloo has its roots in the south of India, in the seafaring states of Kerala and particularly Goa, the areas formally colonised by the Portuguese. The Portuguese brought with them carne de vinha d’alhos, a traditional feast dish of meat cooked in red wine with garlic. 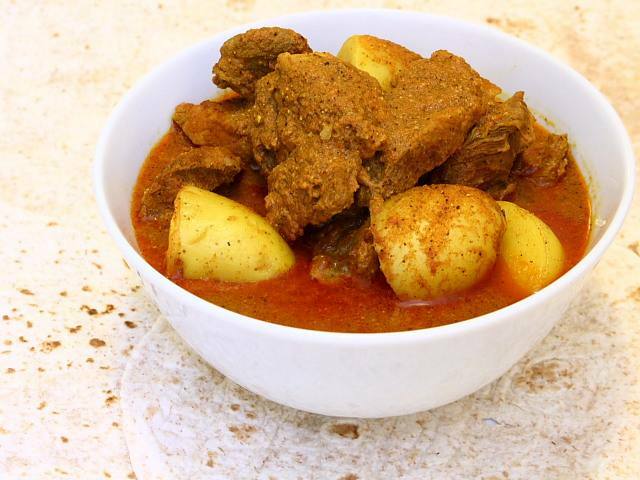 The vindaloo represents the collision of Portugal’s culinary heritage with that of India. Carne de vinha d’alhos gained some spices, a lot of chilli, and somewhere along the way, the wine gave way to vinegar, and the vindaloo emerged. A vindaloo can be made with any type of meat, but it should really be pork, which again nods to its origins in Goa’s Portuguese Christian communities. It’s a fascinating cultural history, and an excellent example of how food transcends cultures and grows because of that. This version of the vindaloo is more refined than the usual Indian restaurant version. It isn’t ridiculously hot, because the heat isn’t the point of a proper vindaloo – it’s about the vinegar, the sharp and sour notes punching through the rich and spicy flavours. The chilli is important, of course, but it’s the shock of the vinegar, and the pork, that’s takes centre stage in the vindaloo.
. Jaffrey seems almost reluctant to call it a vindaloo…she explains that whilst it has the pork, garlic and chillies that are the building blocks of any vindaloo, they’re present in ‘gentle proportions’. This is not a curry for the lager/fight crowd, but it does show what a real vindaloo should taste like. First, to the spices. Grind a teaspoon of brown mustard seeds, a teaspoon of cumin seeds, two teaspoons of coriander seeds and just three whole cloves together in a pestle and mortar, or better still, a coffee grinder. Coffee grinders are the kind of thing that people buy with good intentions but rarely use…ask around or hunt through some charity shops or eBay and you might just find one that you can dedicate to spice grinding duties…it’s guaranteed to improve your Indian cookery. When the spices are finely ground, add them to a blender along with about 140g of roughly chopped onion, five cloves of garlic, an inch long piece of peeled and roughly chopped fresh ginger, two tablespoons of cider vinegar, about three quarters of a teaspoon of cayenne pepper (go on, then…push that up to a whole teaspoon if you’re feeling reckless) and two teaspoons of good, bright paprika. Blitz everything together, adding a little water to get things moving. Now for the meat. You’ll need 560g of boneless and skinless pork shoulder, cut into hefty chunks about two and a half centimetres square. It’s most likely that you’ll buy your pork as a whole joint, with the skin on. Don’t waste the skin – score it, salt it and roast it in a hot oven to make crackling. Pile all the meat into a large bowl and sprinkle half a teaspoon each of turmeric and black pepper and a teaspoon and a quarter of salt over, and add two tablespoons of the spice paste from the blender. Mix everything together very thoroughly, cover and refrigerate for at least half an hour, much longer if possible. I can’t see this coming to any harm if left overnight. When you’re ready to cook, heat a very generous glug of corn or groundnut oil in a large pan and, when it’s hot, add a further teaspoon of mustard seeds. When the seeds start to angrily pop. add the rest of the spice paste and stir and fry until it starts to brown. Add the meat and all of its marinade and stir and fry for a minute, then cover, reduce the heat and let the pork simmer for ten minutes. Add 750ml of water, half a teaspoon of salt, half a teaspoon of sugar and 340g of waxy red potatoes, cut into big, inch sized chunks. Bring the dish to the boil, then simmer gently for about an hour. Serve with chapatis or rice. It's a shame most British people don't know what a vindaloo really should be like. I love the one that Anjum Anand makes which is fairly similar to this one. So interesting to learn about the history of this dish – I've always wanted to try making it. Looks delicious! I hav visited Goa so many times and everytime I go there, I taste this dish. Yes, we can always alter the "hotness" level by decreasing the amount of Chilli. Grat photograph and a lovely recipe! I’ve tried a very similar recipe several times – it’s actually quite easy to make and works with Chicken. I use a little more vinegar btw.